Your team doesn’t have enough players for your next game – what do you do? It is prior to the cancellation deadline and your team has not cancelled more than one game this term. Just email your League Administration (im.soccer@ubc.ca, im.basketball@ubc.ca, etc. which can be found on the respective league webpage) and let them know you need to cancel your game on [insert day]. Please be very specific if you have multiple games that day (Volleyball, Dodgeball, Ultimate) about which game(s) you are cancelling. Cancellation Policy: I am considering cancelling my game. What should I know? If 3 school days or more prior notice is given by a team, the game is canceled and the requesting team records a loss (1-0) and will not receive a default. If fewer than 3 school days’ notice is given in league play, the team is required to play. If the team fails to show up to a game, a default is charged. If the team does show up, but with insufficient numbers, they may attempt to use non-roster players to avoid defaulting. If this occurs after the roster deadline, the team will incur a forfeit (refer to flow chart for these specific outcomes). Teams may cancel a maximum of 2 games in a season before they are ineligible for playoffs. It is prior to the cancellation deadline and your team has already cancelled one game this term. 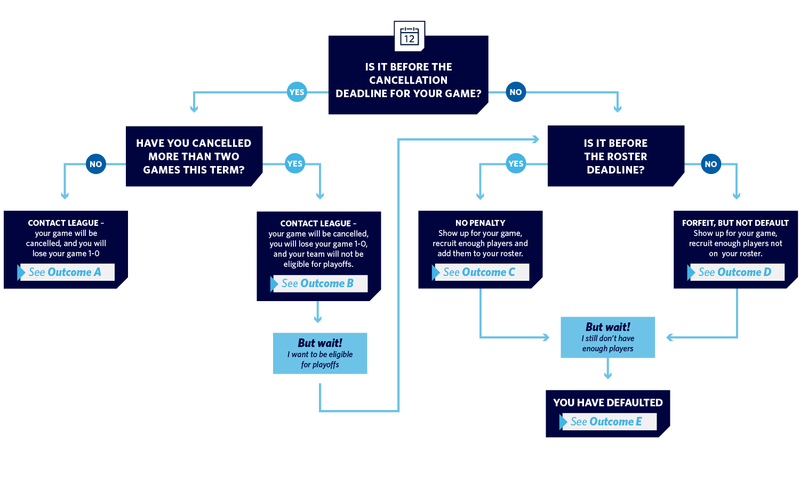 Note: If you want to still be eligible for playoffs refer to the flow chart at the top of this page about how you could recruit more players. If you know you won't have enough players for your next game, but were not able to cancel your game before the cancellation deadline, you and your team mates should ask around your classes, residences, clubs, or even other teams in your league to see if anyone would be interested in being a substitute player for your game that day. By meeting the minimum # of players requirements, you will be playing a fully legitimate game and you will not Default. Who knows, you might have just found a new full-time player fr your team as well. Please note that all players playing for your team still need to sign in for each game for your team, regardless if they are temporary or permanent players. Number of Players Policy: How many players do I need on the field to avoid defaulting? Each team must field a certain number of players, also abiding by the team’s respective participation structure restrictions and divisional import restrictions, in order to avoid forfeiting or defaulting. Eligibility Policy: Are my recruits eligible to play? Participation in most Intramural events, tournaments, and leagues is restricted to current UBC staff, faculty, and students. Proof of UBC status is required for participation in all programs. Intramural programs that are open to the community include Day of the LongBoat, Pumpkin Run, Lace Up for Kids, UBC Triathlon Duathlon, Storm the Wall, and the UBC Summer Soccer League. Note: Students who are associated with the university but do not pay an Athletics and Recreation fee (ELI, Affiliated Colleges) are eligible to participate in the same manner as UBC Staff and Faculty, but must have a valid UBC ID #. In addition, these students must be on rosters submitted by their affiliated group to UBC Recreation Intramurals and meet the individual requirements of the affiliated group. Please check with the administration of your affiliated group to determine requirements. To avoid defaulting your team must show up with the minimum required players, but you can forfeit the game and still be in good standing. Forfeiting a game is a much better outcome than Defaulting. You lose by less, and there is no loss to your Default Prevention Deposit refund. So even though it is after the Roster Deadline, you and your team mates should work to recruit players from your classes, residences, clubs, or even other teams in your league for your up coming game so that you meet the minimum # of players requirement and only Forfeit and don't Default. Forfeit Policy: What happens when my team forfeits? A forfeit occurs when a team requires the use of non-roster players to provide the minimum number of players for a game to avoid a default. This can only occur after the roster deadline. Additionally, a forfeit is applied when a CoRec team does not have meet the gender requirements. All teams are allowed a maximum of one forfeit during each session or term of play. Any team receiving a second forfeit will be automatically be ineligible for playoffs. Exceptions: Double Header Leagues (Volleyball, Ultimate, Dodgeball). Your team must forfeit in different weeks to become ineligible for playoffs. Forfeiting both games in a day will not disqualify you from playoff eligibility. Outcome E: Your team has defaulted - what to do next? If this is your first default of the season with this team, your team will be charged $25.00 of your Default Prevention Deposit. You will lose the game you defaulted by the Forfeit Policy score listed above, but you are still in the league and you are expected to show up to your next scheduled game. If your team finishes the season without another default, you will still be eligible for playoffs (if applicable). If your team defaults a second game, your team will be charged the final $25.00 of your Default Prevention Deposit. At this point, your team will be removed from the league and will receive none of your Default Prevention Deposit back or be refunded any of your registration fee. Default Policy: What happens when I default? In the Intramural Leagues Program, a default occurs when a team fails to sign in with, and be able to play with, the minimum number of players for their respective sports (see below for the Minimum Number of Players Policy). Any fewer players, and an inability to utilize the League Forfeiting Substitution Rule, will result in a team receiving a default. Defaulting teams will record a loss for the defaulted game by the same score by league as with the Forfeit Policy (see below for Forfeit Policy). New for the 2018/2019 School year is the Default Prevention Deposit. Due to a rise in the number of teams defaulting each semester, we have implemented a new policy to help address this issue. Each team (except in the Todd Ice Hockey League) will now pay a $50.00 deposit in addition to their team registration fees. This deposit will be held by UBC Recreation Intramural Leagues until the conclusion of playoffs each semester. If a team defaults at any point during the season, $25.00 will be removed from their deposit and be used to compensate the team that was defaulted against in some way (Teams defaulted against will not be compensated with money directly). The defaulting team loses the game as well. If a team defaults a second time in the same season, the remaining $25.00 will be removed from their deposit and again be used to compensate the team that was defaulted against. However, as they defaulting team no longer has any deposit left on their account, they will now be removed from the league without refund. If a team does not default during the course of the season, the entirety of the $50.00 Default Protection Deposit will be returned to the person who registered the team, after playoffs conclude. Teams that defaults once during the course of the season will receive $25.00 of their Default Protection Deposit back at the end of the season.